Hundreds of demonstrators have marched in Johannesburg, South Africa, against new measures they fear will muzzle the country's media. They criticised plans to introduce a "protection of information" bill and a new media tribunal, to punish journalists who step out of line. 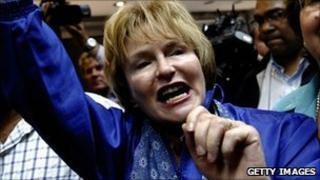 Helen Zille, leader of the opposition Democratic Alliance, said the proposals are worse than apartheid-era measures. The protest came days before the ruling ANC holds its national conference. Demonstrators carrying placards condemning press censorship marched to the Constitutional Court to voice their anger against the two proposals. The protection of information bill would allow the government to classify material that is currently not secret. The media tribunal, which would be answerable to parliament, would have the power to jail or fine journalists for inaccurate reporting. Ms Zille - once herself a prominent journalist - has described the tribunal as a tool to mask corruption. She argued it would be worse than the apartheid-era media council, which was headed by a judge. The ANC says new legislation is needed to make journalists legally accountable for inaccurate reporting. Its policy conference next week is expected to focus heavily on policies to regulate the media. With divisions in its party ranks, measures to tighten control of the press appear to be popular with many ANC members.